Available on April 11th. Award winning 204 school district. 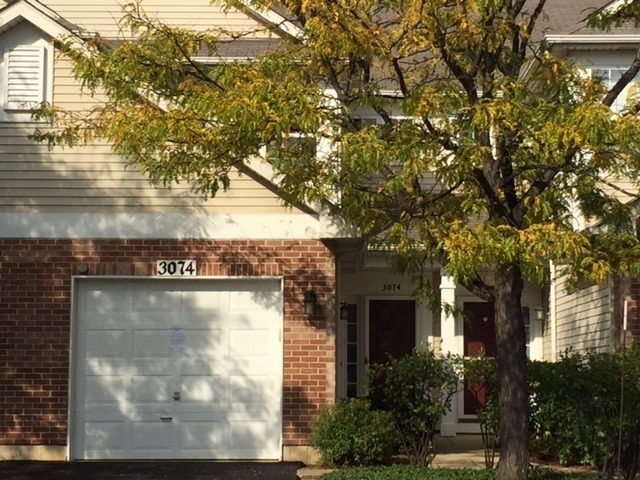 THIS 2 BEDROOM 1 AND 1/2 BATH TOWNHOME HAS BEEN FRESHLY PAINTED AND IS IN MOVE-IN CONDITION. THERE ARE HARDWOOD FLOORS IN THE FOYER AND KITCHEN AND WOOD LAMINATE IN THE LIVING ROOM AND BEDROOMS. THE KITCHEN HAS A BREAKFAST BAR OPEN TO THE LIVING/DINING AREA. THERE IS A LOVELY FIREPLACE WITH GAS LOGS AND BUILT-IN SHELVING IN THE LIVING ROOM. THE MASTER BEDROOM HAS A VAULTED CEILING AND TWO CLOSETS. THE PATIO BACKS TO A NICE OPEN SPACE WHICH GIVES YOU PRIVACY. Walking distance to many restaurants, shopping, and entertainment venues. Easy commute to Downtown Naperville, I-88 Corridor, Fox Valley Mall, Chicago Premium Outlets, Whole Foods, Crate & Barrel, Lowe&apos;s, Costco, Fortune 500 Companies including Alcatel-Lucent, Navistar, Nicor Gas, BP America, Nalco, and Fermilab, also to major area hospitals including Edward Hospital and Health Services and Rush-Copley Medical Center.